Mr. Insta is a dedicated to providing Instagram promotional tools. It offers free followers and likes for new members, giving them a good starting point. Their auto-likes and auto-followers services are top notch offerings in the industry. Mr. Insta is one of the more recent providers of social media boosting services, having been established in 2013. Despite its short history, the site has caught the attention of many customers with their website claiming to have served over 1 million customers. Their biggest draw is the site’s diverse Instagram follower packages. Aside from the standard one-time packages, they have a male/female-only followers service, and the daily automatic-followers service giving you a set number of followers every day. 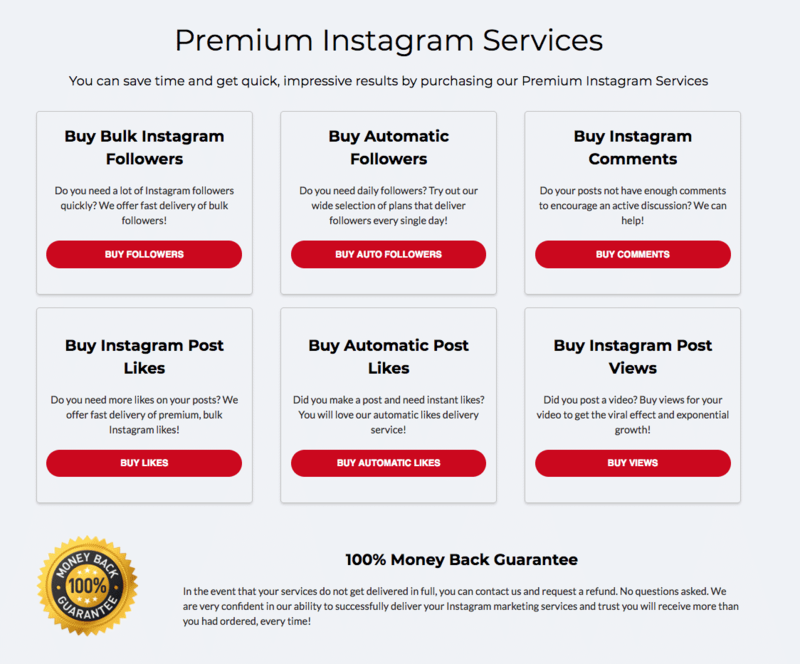 Using their comprehensive Instagram promotion packages is also convenient. Mr. Insta is a social media promotions provider that was established in 2013. The company offers all of the common Instagram boosting services, including Followers, Likes, Views, and Comments. They are one of the few providers who offer bundle packages that provide all of these services in one purchase. Outside of Instagram, Mr. Insta provides similar services for Facebook and YouTube. While this means they have limited coverage across all social platforms, the affordable prices that they offer has attracted many customers - they claim to have sold over 47 million Instagram followers alone! The company has written out decent refund policies, and has responsive customer support. All things considered, they are a reliable and recommended provider of standard, as well as advanced, Instagram services. Mr. Insta offers several Instagram followers packages, ranging from 250 to 20,000 followers. The site also uniquely offers male or female-only followers. Delivery starts within 24 - 72 hours after you order. They claim on their website that completion time is typically within 72 hours as well. Aside from followers, Mr. Insta also offers Instagram likes, comments, and views. Alternately, you can opt for bundle packages containing all of these services together. We reviewed the terms and conditions sections on the Mr. Insta website and made a few comments on their status below. To find out more details on these, then please toggle the sections to see what we thought! Mr. Insta assures their customers that they do not handle all the payments made to them by customers. Instead, these are processed by third-party firms like Paypal, with the payments being made to them afterwards. This guarantees that they do not have access to your payment information. The site states that in order for you to use their services you must set your account to “public.” You also need to maintain the same Instagram username that you made your purchase with. In case you want to change your username, you need to repurchase your plan and inform them of the name change. They will cancel the previous plan and refund any unused amount from that plan. Mr. Insta also explains that, since they use promotional methods to attract your followers, they do not have control over who follows your account. Thus, they don’t have control on whether these followers will drop or not. They provide excess followers for each order to compensate for this. Mr. Insta states that they only collect your email and Instagram profile URL. Both are used purely for delivering your order, and for providing marketing materials. They assure that they do not sell or share your information with any third party. The site also discloses various tracking tools like cookies and Google Analytics to study how you use their site. This is done only to provide you with a better browsing experience. The site assures that all the information they get from these tools are not tied to any personally-identifiable information about you. Mr. Insta gives three specific situations that they consider eligible for refunds. All requests for refunds must be made within 7 days after your initial purchase. Mr. Insta’s staff will review your claim and will respond within 24-48 hours to inform whether your request is granted. Non-delivery of services: The site reminds that processing and delivery times might sometimes take longer than normal. They advise you to contact their customer support first before filing a non-delivery claim. Product not as described: You need to provide clear evidence that the product that you received is not as specified on the site. Cancel recurring services: This option is available for those who use Mr. Insta’s Followers subscription services. You can opt to either immediately cancel the service immediately, or continue on until the end of the current billing cycle. The site offers an additional satisfaction guarantee that you can claim within 7 days after purchase in case you are not happy with the service. This guarantee comes in the form of other incentives that you can use on the site. Mr. Insta does not have a retention policy available on their website. Anyone experiencing under-delivery is advised to contact their support team within 7 days of their order date to effect any sort of change. Mr. Insta has an online contact form as its main customer support channel. They claim to respond to your inquiries within 24-48 hours. The company is also one of the few providers that actually have a dedicated 888 phone number; 1-888-881-9070. This is a good option for getting real-time assistance in lieu of a live chat feature. Additionally, the site has an FAQ page where you can get answers about its services. It also provides more in-depth explanation of its subscription plans. Mr. Insta suggests that you visit the page first before contacting their customer support team. Mr. Insta explains that, due to the methods they use to attract followers, they have no control over these followers eventually unfollowing you. To compensate for such potential drops, the site delivers followers in excess of the amount you order. In case of noticeable drops, the site says they will refill your followers immediately. You just need to email them your purchase receipt to get your follower numbers back. Mr. Insta claim that they start orders within 24 hours, and complete orders within 72 hours. It is expected that larger packages take a little longer. There are no claims on the Mr. Insta site as to how high-quality their followers are. Since they claim in a few spots that they are targeting real users, you should expect them to by high. We'll let you know after further testing. They claim that their followers will not drop after you get them on their website, and that they will replace any which do if you contact them. Mr. Insta have an extensive array of Instagram services that cover every possible need you could have for improving your account. Where they truly shine is with their subscription-based services which allow you to show slow and consistent growth over a period of time you choose. For those with multiple needs, they offer packages which bundle a number of their services together. Mr. Insta stands out among providers with their diverse selection of Instagram Followers services. Aside from different-sized packages, and the already mentioned follower subscription service, they have gendered targeting options. Their bundle packages let you combine several services together for better deals, which is another unique selling point. 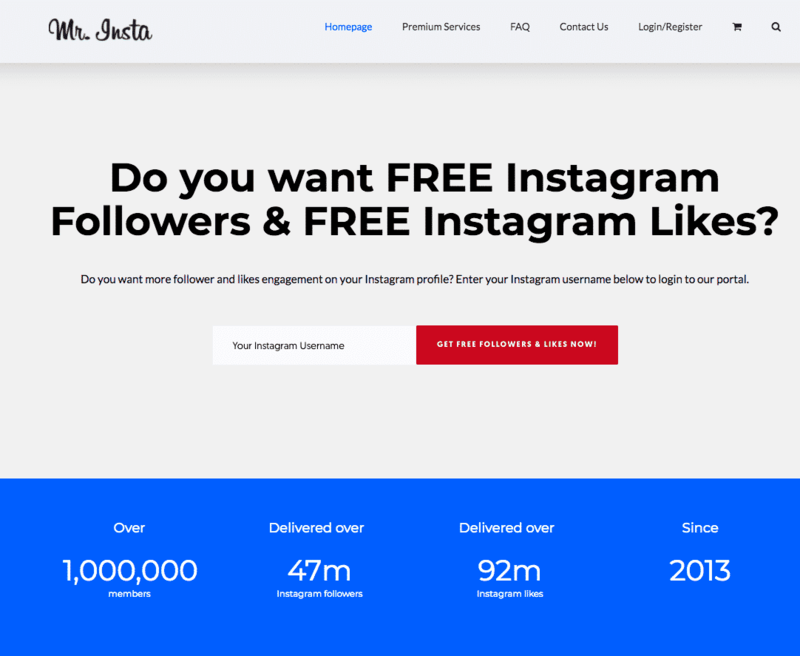 Overall, Mr. Insta is a good option if you want to if you are looking to strengthen your Instagram account’s popularity with high-quality followers. Discover for yourself what they can offer by clicking on the button below. Nice Blog! and well-explained also. I highly recommend this blog to everyone. This is my 5th time using mrinsta and each time they deliver what they promise. I have to point out their great customer support for their quick and decisive action on an issue i was facing. In the course of boosting instagram accounts which is what i do for clients i always pay more importance on quality. Whereas the quantity of followers is important, there is no point having thousands of followers who end up affecting your reputation. Its my third time using mrinsta and they always over deliver, top notch followers is what i get. They don't promise the moon but they will deliver something close to the moon not to mention their prices which are relatively cheap and highly competitive. They also deliver on time which makes their services totally reliable. I am enjoying my experience with them. I work in an environment that demands quality over quantity. I am glad i came across this service because quality is what i wanted and i got more than i had anticipated . As a digital marketer, mr insta comes with all I need to grow various Instagram accounts as needs arise. Grateful! I really love what these guys do. Their packages are quite affordable too. I'll definitely come looking for them again. So far so good. I'm enjoying their services. It's been 4 days and my order is not yet fully delivered. But I'm giving them 3 stars for the quality. The followers look legit and active.